Thanks for reminding me about this past Newbery winner—I missed it too! I’m excited to see the Newbery winners this year—thanks for the predictions! You're welcome. I'm sorry I don't know your real name! I loved this book but failed to ever find time to write a review. My favorite this year was THE TRUTH AS TOLD BY MASON BUTTLE. I've actually heard of that one, Greg! Good to know. I'll add it to my never-ending list. Thanks! I heard Erin won and was excited for her. Glad you are back when you can, Joanne. Hope you have a healthy and happy new year! Thanks, Natalie. Same to you! Happy to see you! Sadly, I haven't read "Hello, Universe." I've heard about it, so I need to add it to my list -- especially since it won a Newbery. It's a gem, Patricia. Hope you get a chance to read it. I'm no good with predictions, since I'm always a year or two behind the books! This one sounds delightful though, and your belated congratulations are appreciated I'm sure! Well, only if she sees them! I hear you about always being a year or two behind. So nice to see you back here! I'm glad you are better. I haven't read this book yet. I need to get to it. I'm keeping my fingers crossed for One True Way by Shannon Hitchcock. It's such a good book. Happy New Year. Wonderful to see you back! I read a few good books this year but I'm terrible at making predictions. I really liked Front Desk. And ooh, The Miscalculations of Lightning Girl. And The Length of a String. I don't remember their publication dates though. I may be a year behind too! Thanks, Andrea. I read THE MISCALCULATIONS OF LIGHTNING GIRL too. That definitely pubbed in 2018, so it's eligible. I read it back in the spring, after getting home from the second round of hospital/rehab center, so unfortunately I remember very little of it! I should read it again. The other two you mentioned came out around the same time, May 2018. Thanks. I'll add them to my TBR. Joining my voice to all those who are thrilled to have you back blogging, Joanne. I know the past 12 months have been very grueling for you. I send you all my best as you continue your recovery, and hope that 2019 will see you return to full health. Thank you, Michael! I've actually been back blogging since May 2018, but only once a month (all I can handle) and then I skipped December because there was just too much going on in the Fritz household! It's actually been more than 12 months since my second aneurysm rupture in Sept 2017. Hard to believe! I hope to keep up with book reviews for MMGM, but also to eventually talk about other things, and not limit myself to book reviews only. 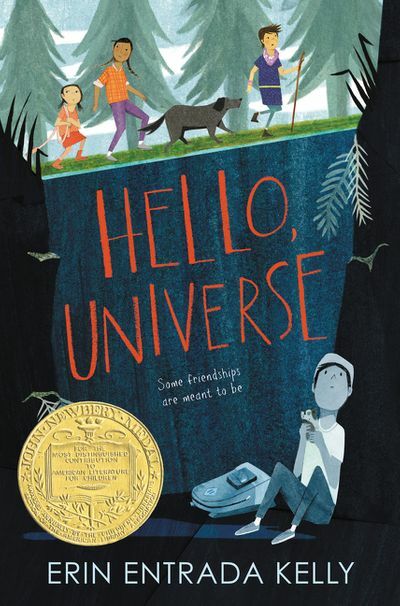 I have nor read Hello Universe and had forgotten that it got the Newbery (probably because I hadn't read it). After reading your post I have added it to my list. Hopefully I will get to it this year. Wonderful to read your blog post. Wishing you a happy and healthy 2019. Thanks, Jess. Now I don't feel so bad that I had no idea it had won in the first place!